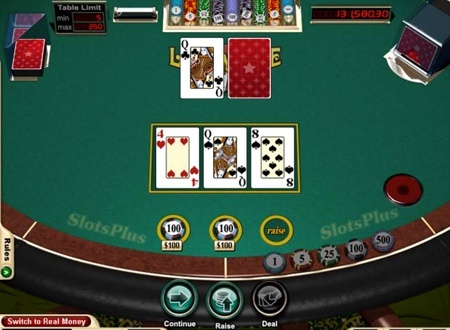 Let 'Em Ride is a variation of poker game where a player need a pair of 10's or better to win. You are dealt 3 cards face up and 2 cards face down. You can let 'em ride and just select continue to reveal face-down cards or you can raise your bet with each turn of the cards. How to Play Let Em Ride Poker? First choose your chips and place your bets. Remember, if you want to make a Bonus Bet of $1 (and qualify for a jackpot) you must make it before the cards are dealt. You are dealt 5 cards, three face-up and two face-down. You place an ante bet before the cards are dealt, the maximum ante bet is $120. On your first three cards you can either raise (and double your ante bet), or continue without placing the bet. The fourth card is then revealed and you get to again either Raise or Continue. The final card is turned and winning hands are paid. Your goal is to have s hand with at least a pair of 10s or higher. You are paid out according to the paytable ranging from 1:1, for a pair of 10s or higher, to 1 000:1 when you get a Royal Flush. Let 'Em Ride poker offers you an ability to win progressive jackpot for an extra side bet. The Bonus Bet costs a fixed $1 and must be placed before the cards are dealt. You win 100% of the jackpot by getting a Royal Flush. Straight Flush wins you 10% of the jackpot, Four of a Kind gives you $500, a Full House - $100 and a Flush pays $75. The following strategy is optimal for the basic rules and standard payout table (for the main ante bet). The strategy allows you to decrease the house edge to about 3.5%. Inside Straight means that one or two of the "inside" cards is missing, for example 4-5-6-8. Outside Straight is a combination where "outside" card(s) is(are) missed, for example 4-5-6-7.